Most businesses start with one customer, however remaining reliant on just one customer can have serious consequences, which I detailed in my recent blog post "Help with invoice finance prime debtor problems". Whilst the problem is particularly problematic if you are using factoring or invoice discounting, the risks to your business also apply if you don't use this type of funding. Cash flow crisis caused by late payments. Potential business failure should the customer fail, change suppliers or dispute their entire debt. Lack of security as you are always susceptible to either of the above occurring. Failure to grow your business as demand is limited by your customer. Potential for IR35 tax issues if you are trading with just one party, providing services such as consultancy. Prime debtor funding restrictions if you use an invoice finance company. 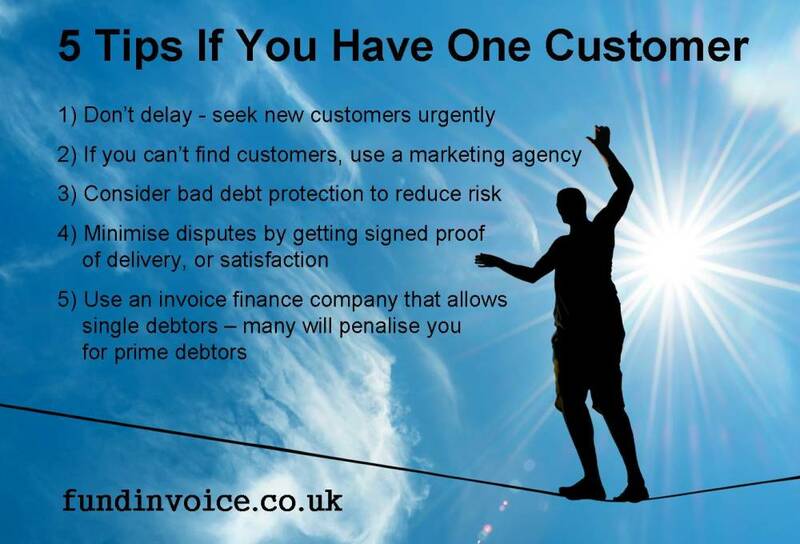 I have put our 5 tips if you only have one customer into an infographic which might be useful to any business that is struggling with a single debtor situation. Some of the suggestions, like "take action immediately", might sound obvious. However, many businesses make good money from their one and only customer, hence they delay addressing the problem until it crystalises. The contingent risk can be mitigated by taking action immediately. If you can't find new customers yourself, consult with a marketing agency who will be able to help. <a href="https://www.fundinvoice.co.uk/blog/advice/post/5-tips-if-you-have-only-one-customer.html" ><img src="https://www.fundinvoice.co.uk/images/5-tips-if-you-only-have-one-customer.jpg" alt="5 Tips If You Have One Customer" width="450" /></a><br /><a href="https://www.fundinvoice.co.uk/blog/advice/post/5-tips-if-you-have-only-one-customer.html" >5 Tips If You Have One Customer</a> from <a href="https://www.fundinvoice.co.uk/" >FundInvoice Invoice Finance Solutions</a>. <a href="https://www.fundinvoice.co.uk/blog/advice/post/5-tips-if-you-have-only-one-customer.html" ><img src="https://www.fundinvoice.co.uk/images/5-tips-if-you-only-have-one-customer.jpg" alt=" 5 Tips If You Have One Customer " width="1000" /></a><br /><a href="https://www.fundinvoice.co.uk/blog/advice/post/5-tips-if-you-have-only-one-customer.html" >5 Tips If You Have One Customer</a> from <a href="https://www.fundinvoice.co.uk/" >FundInvoice Invoice Finance Solutions</a>. You will also find copies of this infographic on all our social media feeds, so please feel free to share it via social media. Read our free Guide To Growing Your Business.